To some people, the simultaneous exodus of millions of bats from a cave might send chills down the spine - especially one big enough to accommodate forty Boeing 747 airplanes. But for nature lovers and caving enthusiasts, it’s quite a different story. Each year almost half a million people journey to the caves in Malaysia’s UNESCO World Heritage listed Gunung Mulu National Park in Sarawak to witness what is surely ones of nature’s more spectacular sights. One of two UNESCO World Heritage Sites in East Malaysia, Gunung Mulu is the largest national park in Sarawak, covering almost 544 square kilometres. Featuring the world’s largest cave chamber (Sarawak Chamber), the world’s largest cave passage (Deer Cave) and Asia’s longest cave (Clearwater Cave), it is also home to a massive 2,000 varieties of plants and animals, including 8 species of hornbill, 170 species of orchids and 10 species of pitcher plants. The Park also houses the world’s longest tree-based walkway – a 480-metre rainforest canopy skywalk, providing spectacular views of the razor-sharp limestone Pinnacle. Not for the faint hearted, the Sarawak Chamber is the world’s largest underground cave chamber, measuring an astonishing 240,000 sqm and soaring to an 80m high ceiling. To reach it hikers must follow a river upstream from the cave entrance to reach the chamber, a passage almost as dramatic as the cave itself! As well as being the world’s largest cave passage the Deer Cave is also home to some 3 million bats, who spiral out of the cave and into the rainforest each evening. The best spot to catch this natural phenomenon is the bat observatory deck where visitors to the park can witness up to twelve species of bat, including a colony of rare wrinkled-lipped bats, head out for take-away, Gunung Mulu style. 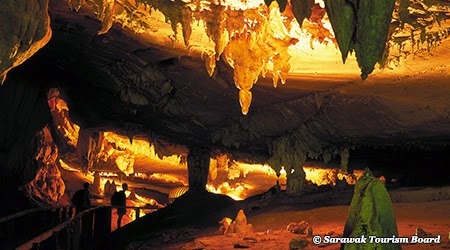 A stone’s throw away from the Deer Cave is the exquisite and tiny Lang’s Cave, adorned with stalagmites and stalactites. Here, visitors can experience an intimate encounter with rare white cave prawns hiding in pools – and of course, more of the aforementioned bats, or enjoy a picnic in the Clearwater Cave, named on account of its crystal clear subterranean pool, while gazing in awe at the exquisite profiles of the cave, which make it the perfect spot for photo opportunities. The Racer Cave offers up a challenging experience for more adventurous and intrepid travellers. Named after the local racer snake, the cave tests the endurance of visitors, who must navigate their way through the caves using ropes, sliding, crouching, twisting and turning to access some of its more remote treasures. The opportunity to gaze upon some of the amazing limestone walls makes the effort well worth it. At the other end of the spectrum, the Lagangs Cave is easy to explore and is considered ideal for beginners and families, featuring lots of stalactites, stalagmites and ancient riverbed sediments. Visitors are not permitted to enter the caves without a licensed tour guide. The best and most experienced guides can be booked through Gunung Mulu, with overnight stays staring from as little as RM 285 per person.